Inform a Nord that his cousin has been killed. Deliver the final words of the fallen. I discovered the body of one of the Fighters Guild soldiers in Mal Sorra's Tomb. She started writing a note to her cousin, Grundskar, another soldier. While in Mal Sorra's Tomb, you can come across a woman's body in the tunnel between the two larger caverns. Read the note next to the body. 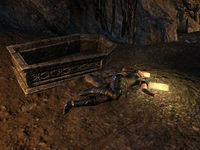 "When we originally spotted this ancient Dark Elf tomb, I knew I had to explore it. I was hoping that my cousin, Grundskar, would have accompanied me, but we got separated when our Fighters Guild troop scattered." "I made it past the front door, but stealth was never really my strong suit. I didn't expect the place to be crawling with skeletons! I'm going to hide until they settle down. I should be fine if the damned scuttler doesn't give me away." I should let Grundskar know what happened to his cousin. After deciding to deliver the news, you will begin the quest and receive Nettira's Journal. Take the time to read the book within your inventory for it register in the Eidetic Memory and leave the tomb. Your next step is to find Grundskar, while you may have previously met him at the Orchard wayshrine, he will no longer be there. Instead, head back to the Hollow City through the nearby wayshrine. 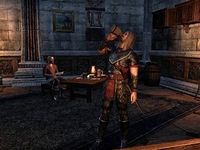 Once in the city, go to The Shining Star, where you can find Grundskar drinking near the bar. Talk to him to deliver the news. "So much death and destruction. I don't know why I'm surprised. I never expected Coldharbour to be a walk in the snow." I have news about your cousin. "More sad news? This wretched domain is full of it. Still, it's better to know what happened to Nettira than to wonder what fate befell her. Thank you for that." You will then receive a small amount of gold and a pair of Battle Bracers. Finishes quest I should find Grundskar and tell him what happened to his cousin. This page was last modified on 3 February 2019, at 03:56.